Sam Adiv is the Founder of OpenTent, a community-building strategy consulting team specializing in relationship management systems. OpenTent is based in Brooklyn and proud to work with JFNA and local Federations. Good stories change our minds, and great stories change the world. The best stories start with authentic, accurate, and clear data. The process of translating your organization’s data into stories is a critical journey that deserves constant and intentional organizational focus. Data: the smallest piece of information one can gather. A data point is usually a number or true/false value or text value. A data point is raw and does not serve any purpose by itself—except to create information. Stories are, of course, the most important level, and getting the data right at the base of the pyramid will fuel those stories. But the building blocks in the middle - Information, Knowledge, and Wisdom - are where the real transformation happens. Now more than ever, we have widely available tools that help staff teams translate Data into Information, build analytics to facilitate Knowledge and embed sustainable office processes to generate Wisdom. 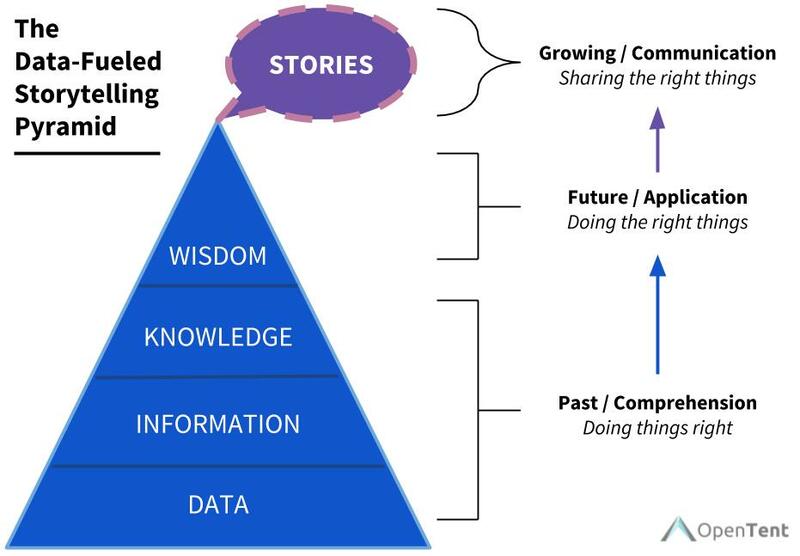 Organizations that are interested in telling better stories about their work should consider every step in this pyramid as equally important. At OpenTent, we work with our clients to operationalize their community engagement through a powerful CRM like Salesforce. The overeager marketing for CRMs like Salesforce seems to imply that once you start using Salesforce, you’ll sail up the pyramid from Data to Stories with just a few clicks! We have found over and over that the real work happens in the middle layers, through empowered end users who make smarter decisions based on the Knowledge and Wisdom they glean from their CRM.